This powerful, yet, elegant vehicle is 3.6L with 304 horsepower and direct injection V6 beast. Great handling on all roads - dry and inclement, urban and city. 304 horsepower, 3.6 liter DOHC V-6, six speed automatic with driver shift control Feels heavy, but trust me, this thing can really move. This stealth vehicle has commanding prowess - the car has exquisite handling and steering, accelerating and braking; just an all around star. Having said that, this car is not designed for family, but rather for the single person, empty nesters, or couple without kids. Why? Getting in and out of the car takes too much effort. No mother is going to be taking such efforts to fidget getting to the back seat. Heck, even for me, the door is as long as I am (60 inches) and is sturdy and heavy. Blind spots are too many for me in this car - the angle and slant of the back window is too severe to get full visibility. This car is based on a virtually identical concept that premiered as a pleasant surprise a couple years back at the North American Auto Show. A real head turner, it garners attention wherever it goes. You can't be shy and drive this car. Onlookers come out of the woodwork. It's another hit in a growing list for Cadillac. Bravo! Airbags abound, with font and side impact airbags on driver and passenger sides, head curtain side airbags. Rear vision camera. Disc brakes, electronic parking brake and stability control. Hands free Bluetooth? technology. The usual suspects: Front an side airbags, head curtain side airbags, rear vision camera, active front head restraints, OnStar, etc. Bose 5.1 surround sound system rocks the car. The 40 GB hard drive stores your personal music selections. Love the giant 8" touch screen navigation system; when not in use it retracts into dashboard. Power heated outside mirrors, heated steering wheel (love this at zero degrees). OnStar crash response and navigation. Retuned chassis for better handling over the already strong handling sedan, Bluetooth connectivity, deployable infotainment system display, Bose 5.1 surround audio and adaptive forward lighting, OnStar has speech recognition flexible recognition and fully continuous dialing and chunking and directed help; heated and vented seats for driver and front passenger, power heated outside mirrors, gorgeous Sapele wood trim, navigation system with Bose 5.1 surround system, 40 GB hard driver device with XM Nav traffic, etc. This state-of-the-art design centric auto is so smart and 2nd decade 21st century. Stealth and sweet. The remarkably handsome 19" aluminum wheels are aggressive and assuring. Refined and stylized cabin and controls, has suburb comfortable leather wrapped seats, leather wrapped steering wheel, french-stitching, fabulous chrome accents, and paddle shifts. Paddle shifters--- really, who uses these? Save the money?.as women drivers aren't flocking to the dealers with this being a top option request. What can I say? Stunning? Yep. Arresting? Of course. Breathtaking. You bet. Some people don't like the high rear end and steep back window and others complain about what they see as a heaviness around back. Fie on them. They don't know what they're talking about. An absolutely stunning automobile, and one of Cadillac's best ever. 5 year/100,000 mile power train limited warranty. 4 year/ 50,000 mile bumper-to-bumper with premium care maintanence. 5 year/100,000 mile powertain limited warranty, four year bumper to bumper warranty, four year/50,000 mile premium care maintenance, see your dealer. A word to the wise--the very wise: If you want a future collectible, buy this one. 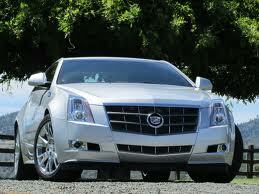 Rumor is Cadillac won't be making it when CTS line is revamped in a couple of years. With the styling and CTS reputation, I expect this one to be a special interest car in a decade or two from now.